Do Dentures Really Make Your Face Shrink? My mother is losing her teeth. I’ve tried for years to get her to brush but she doesn’t like “how it feels”. Now she needs dentures. Of course, she doesn’t have dental insurance or money so I’m having to pay for her new teeth. I can barely afford these dentures and now the dentist tells me if I get them her face will shrink and instead I should get dental implants. They’re massively more expensive. However, I don’t want to damage my mother’s face. Is he right about the shrinking thing? It is truly fantastic how you are looking out for your mother’s best interest, especially given she doesn’t seem to care about taking care of herself. What your dentist referred to with the dentures is known as facial collapse. How it works is once your mother’s teeth are removed, her body will begin to resorb the minerals in her jawbone to use elsewhere. This is because her brain senses she no longer has teeth and assumes she doesn’t need the jawbone. It’s remarkably efficient. If only our government knew how to distribute resources where they’re actually needed. The problem is after ten to twenty years, there’s very little jawbone left, which gives her face a squashed, older appearance. Additionally, it makes it impossible for her to keep her dentures in. He’s suggesting dental implants because the implants serve as teeth roots, which lets your brain know that jawbone is still a necessity. This prevents facial collapse. Should Your Mother Get Dentures? While dental implants are the better treatment, it doesn’t necessarily mean it’s the right treatment for your mother. I’m not just talking about the expense. My guess is your mother lost her teeth because of gum disease. If that’s the case, she’s not yet a candidate for implants. Gum disease causes tooth loss. It will also do the same to her dental implants. Right now, dentures are the best thing for her. If you can convince her to take care of her oral health and get her gum disease thoroughly healed, then you can re-evaluate. However, there’s no point it getting an expensive procedure that will be guaranteed to fail. Is There a Dentures Support Group? Please help me. I feel so foolish. It’s bad enough losing your teeth. But, being poor and losing your teeth is the absolute worst. I couldn’t afford to get dental implants, and yes, I know they’re better. I’m just stuck with dentures. I absolutely hate them. I don’t know if there’s a group or something which talks about how they deal with dentures, but I really need one. I’m not aware of a denture support group, but it sounds like a good idea. You might even be able to start one at your local dentist’s practice. I say that with confidence because you’re not alone in your feelings. 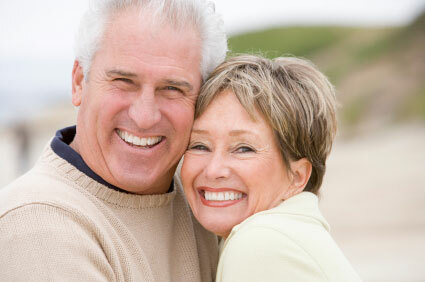 Many people struggle with dentures. One of the biggest complaints is it’s much more difficult to eat food. Many times that can be improved with a better fit of your dentures. However, there are limitations. Even the best fitting dentures still reduce your chewing capacity by 50%. Cutting your chewing capacity in half is a huge drop in quality of life. Another problem is they slip and slide. Removable dentures are, by their very title, removable. Because there’s nothing anchoring them there, they will move. This will happen more and more as your jawbone shrinks, which is a devastating side effect of dentures known as facial collapse. Eventually, you won’t be able to keep them in at all. I realize I’m not telling you anything you didn’t already know and you want solutions, so let’s move on. 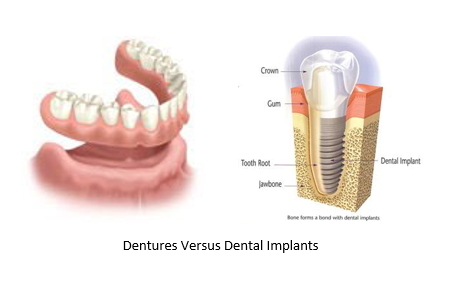 Without having the money for dental implants, most patients feel hopeless, like they’re trapped. However, there is a sort of “part way” procedure that will help a little. 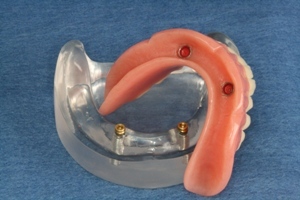 Generally, when you’re talking about implant supported dentures, you’ll need about six for each arch. However, with snap-on dentures, you can get as few as two. This can make a world of difference. The most obvious benefit is they cannot fall out. The implants anchor the dentures to your mouth securing them so you’ll never have to worry about embarrassing public slips. They’ll help you retain your jawbone where the implants were placed. They give you a stop gap while you work toward more implants. Obviously, the more implants you have the better, but starting with two gives you hope, a bit of relief, and a place to start. Our life circumstances change all the time, and there may come a time you can afford to get more implants. This also allows you to save up a bit at a time and you can add two implants in stages as you’re able, until you have the security and chewing capacity you want. I’ve had a problem over the last month of my jaw aching, especially in the morning. I’ve been under some stress and have caught myself tensing my jaw some throughout the day. Then, I got a dental crown. It’s made the pain so much worse. I went back to the dentist…several times. He’s adjusted it several times, but the pain never seems to go away now, plus, it’s always hitting my other teeth before the others. Could this be causing TMJ? Yes, a poorly placed crown can certainly cause or exacerbate existing TMJ problems. There is a lot that goes into understanding how the bite should go together. Some dentists invest more time and training in that area than others. You may have a dentist who doesn’t invest much in it. The fact that your teeth are not meeting uniformly is a cause of concern and he should know that. Some dentists who have trouble getting it right will just adjust and adjust until the patient is too embarrassed to keep complaining and drop it. This needs to be fixed. The fact that your jaw had already had some minor pain and you’d noticed some clenching during the day worries me too. If you notice clenching during the day, you almost certainly are doing it at night as well. You should be wearing a nightguard. They’re custom fit to your bite and comfortable. 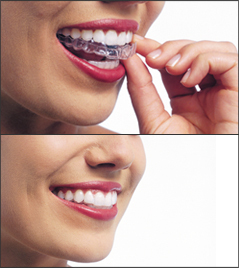 Their function is to protect your teeth and jaw from the pressures of clenching and grinding. It doesn’t sound like your dentist is going to deal with this properly, so you need to see one who understands TMJ. While there isn’t a recognized TMJ Specialty, there are ways to know if a dentist has a good knowledge of the condition. You’ll want to especially look at their post-graduate training. Don’t feel weird asking them about it. It’s important knowledge for you in choosing the right dentist. For instance, Dr. Stanley Burba invested significant training on TMJ Disorder. He’s studied at both the Spear Institute and the Dawson Academy. Some other great centers are the Kois Center and the Las Vegas Institute for Advanced Dental Studies (LVI). If a dentist has trained at any of these institutes, they’re sure to be able to help you. Additionally, if it turns out that your dental crown isn’t properly placed the new dentist can help you get a refund from your current dentist.